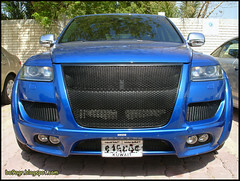 Mr. Bo9agr: Cayenne vs Touareg .. which is prettier?? i think the Cayenne is prettier, what do you think ?? and for more info & pictures of the above cars click here for the Cayenne and here for the Touareg. That Cayenne is not a real Turbo, and not a full TechArt. It's just had the Turbo Grill mounted, with rear exhausts and wheel arches - If I'm not mistaken. I have seen this tuned Touareg on the road and this picture really doesnt do it any justice. it looks wayyy better then the cayenne. In stock form; I think the Touareg looks much better than the Cayenne.. As for aftermarket; The W12 Touareg looks much better than either of these kits. i think the Cayenne is better than the Touareg because of the power/weight ratio, the Touareg is heavier, but it u can get the mighty W12 now that's a good deal. 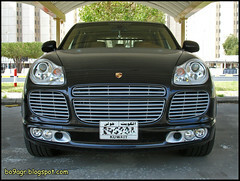 and the Cayenne in the pic, i think it's not a real TechART, i saw it in Kuwait University ..